An iconic destination with exceptional heritage? 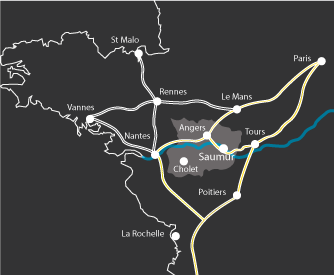 This is the Saumur region, a concentrated history of France and a staggering choice of sites to visit! Experience a medieval fortress or a Renaissance residence, all unmissable gems of the Loire Valley. Originating in the equestrian military tradition, the Cadre Noir of Saumur now forms the teaching staff of the National Riding School. True experts in their discipline, the master riders transmit technical and theoretical knowledge. They also contribute to the development of the French riding tradition through their public appearances in France and abroad. Galas and presentations of the Cadre Noir are characterized by traditional school jumps: courbettes, croupades and cabrioles etc. 650 meters of ramparts and 13 defence towers delimit the perimeter of this extraordinary medieval fortress "Chateau of Montreuil-Bellay", built in 1025. From this period the moats, ramparts and exceptional kitchens with their central fireplace are preserved. The gatehouse, the collegiate, the house of the canons and the new château, built on magnificent vaulted cellars, were all added to the elegant fortress in the 15th century. Note: this fully furnished monument is also a centuries-old vineyard whose vintages and fl avours can be enjoyed on site. Built by Foulques Nerra in the 11th century on a rocky outcrop, rebuilt in the Renaissance, Montsoreau is the only Loire château to have been built on the bed of the Royal River; its moats were thus fi lled by the Loire. Its 25 chimneys and wide mullioned windows express the luxury of that time. Alexandre Dumas immortalized it in 1846 in his work “The Lady of Monsoreau”. Exceptional views over the confl uence Loire-Vienne and the village. Contemporary art. The castle now houses the Philippe Méaille Collection, often described as one of the largest and most radical worldwide collections of Conceptual Art. The château of Boumois (15th c.) was rebuilt between 1520 and 1540 and combines defensive and residential elements. The exterior is fl anked by towers with battlements. The courtyard facade evokes the Renaissance aesthetic. The 17th c. dove house has kept its original features. The château de Montsabert was rebuilt between 1374 and 1380 by Bertrand du Guesclin on a fief that his second wife, Jeanne de Laval-Tinténiac brought to him as a dowry. During the tour, you will visit the gardens, the ground floor and the second fl oor of the château which hosts new exhibitions each year. This favourite residence "Manoir of Launay of King René is where the legendary tournament the “Joyeuse Garde” was held in 1446. On his return from Naples, René extended Launay which illustrates the transition from defensive architecture to the residential architecture of the Renaissance. here at its best. The polychrome decoration and glazed tiles from the 13th century are of particular interest. A 15th and 16th century manor house "Seigneurie du Bois", located in the heart of a small village with a rich historical heritage. During the visit explore the lords’ lodge, pigeon house and moats etc. The Sarré Mill is one of the last watermills in France to produce fl our from wheat crushed with the grindstone. The Lauriou family are millers from father to son since 1908 and continue this tradition from generation to generation. During the visit, see the big bucket wheel. Note: the Auberge du Moulin off ers fouées tasting – a famous local specialty. 18th century watermill which has the rare heritage of a big, Sagebien wheel. Completely restored, Hydronef has a scenography around the history of the mill, hydro power, water motors and renewable energy. Videos and interactive media make the site accessible to all. Note: the tour is completed with the water gardens outside. “Cavier” mill, Gasté was built in 1800 and fully restored. Its 17 meter-high silhouette allows the sails to catch the wind easily. Its wheels now grind the fl our as before, having ceased activity since the Great War. An impressive Neolithic monument, this megalith boasts 15 slabs and weighs over 500 tonnes. Of the Angevine type, the dolmen consists of a chamber preceded by a porch. The burial chamber is 18m long, intact and surprisingly regular in the laying of its huge sandstone blocks. Note: with a volume of 200m3, the Bagneux dolmen holds the European record! This feudal lords’ domaine of Sacé is made up of the ruins of a 13th century fortified house, located above an underground refuge. The botanical garden has over 800 heirloom plants used for dyeing, health, food and even witchcraft etc. Among the plants are some that have become rare in the Loire Valley: corncockle, belladonna or calamint. Note: Grand medieval festival the 3rd weekend of July.